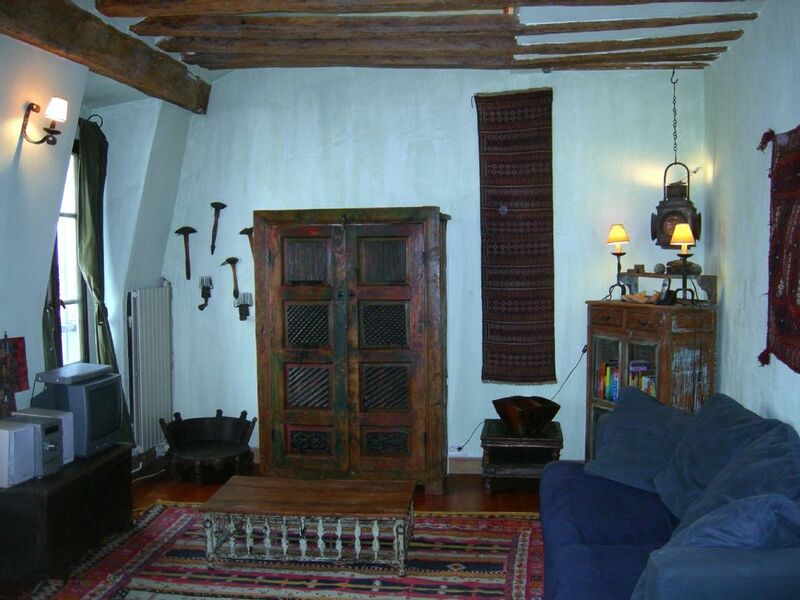 Imagine yourself staying in a charming French Moroccan flat in the heart of the Marais!!!!! Indulge yourself in an elegant 60 meter flat filled with exotic ethnic furnishings yet equipped with modern day comforts. The 1 bedroom 4 room flat is spacious & airy with high beamed ceilings and hardwood floors. the kitchen and dining room open onto one another and are completely equipped with a large fridge/freezer/dishwasher//oven/stove/etc. i.e. ( complete kitchen). The floors and walls are draped with beautiful Moroccan and Afghani kilms and carpets. Come to Paris and experience an ethnic exotic living experience in the heart of the city. Local calls are free and for a flat fee of 40 euros one may have unlimited calling service to Europe, USA, & Canada. ***land line use only in Paris and Europe, unlimited cell phone calls may be made to USA and Canada only!!!!! Great location in the Marais! Arrival and check-in was easy. Street location and building access felt safe and secure. The Moroccan decor was charming and the kitchen was well equipped. Many shops nearby. Steps away from a boulangerie for morning croissants and even a Starbucks down the street for coffee. Fabulous art at Centre Pompidou was a one-block walk. I stayed in this apartment with my husband and 2 children, and found it to be a convenient and happy base for a three day stay in Paris. It's very central - right next to the Centre Pompidou, with plenty of restaurants and places to have a drink right outside (but the windows have double glazing, so if you close everything up the apartment is quiet.) An easy walk to the main shopping area of the Marais, and to the Seine, etc. Ample cupboard space. We were welcomed by the manager, Pacy, who very helpful and friendly. My only complaint is that while the proper bed was perfectly fine, the fold out bed was a little uncomfortable. The apartment is small, and as a family of 4 we wouldn't have been comfortable there for very long, but for a short stay it was great! We enjoyed our stay in Paris. In terms of location and charm this apartment has it in spades. The space was sufficient for a family of 5, adults. One of us slept on a comfortable air mattress. The apartment has a dishwasher, washer and large fridge. It even has a small elevator. My only difficulty with the apartment was with the tub, I have arthritis, so I found it difficult at first. But I worked through it. This apartment is a great value. Would do it again. We really appreciated the greeting and orientation of the home when we arrived, even with an explanation of the closest supermarket. The elevator was so helpful for hauling our luggage up to the 4th floor. You cannot beat the location, in the heart of the Marais - close to everything... and an easy direct metro ride to and from Charles de Gaulle airport. The space itself was perfect for our family of 4 when we needed to put up our feet after walking all day. Very comfortable apartment. Local neighbourhood of Beaubourg had plenty of shops for food and other supplies, and getting about was easy by metro or on foot. Weather was extremely hot during our stay but two large fans were provided and we were comfortable enough given the weather! Only a couple of issues - the internet was fairly flaky, and we had more or less no TV during our stay. However Paula was very helpful in popping round promptly to try to sort things out for us. Staying in Paris in the Marais area is always an exciting and wonderful experience. There is everything imaginable to see do and try and it is all contained in a reasonably small walking area.